BEIJING (AP) — The death toll has risen to at least 22 in the collapse of a group of decrepit homes in eastern China, state media reported Tuesday. 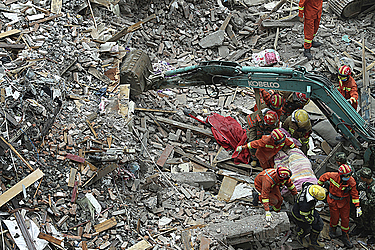 There were six survivors pulled from the rubble on the outskirts of the city of Wenzhou in Zhejiang province, Xinhua News Agency said in a brief report, adding search and rescue efforts were "basically over." The cause of the collapses on Monday was under investigation, although reports said the four buildings were built in the 1970s by their farmer owners and were in a highly degraded state. Extra floors had been added over the years, making them between three and five stories high and further weakening their structures. Poor construction quality has long been a problem in China, particularly in the countryside and smaller cities.